Best Occasions: this is the best blazer in men's wardrobe,suitable for banquet, wedding,graduation, ceremoney,dating, meeting, yacht party, prom, celebration, festival, etc. SIZE NOTE: some customers said our size is slightly larger than US standard size,so we recommend you to check our size chart carefully before purchase. If you want tighter feeling, please choose one size down; if you want loose feeling or you have big belly or wide chest, just choose the true size. MATERIAL --- Polyester&Cotton; Dry Clean Only(Recommended); Hand washes max temperature 40°C, Do not bleach, Iron max 110°C. 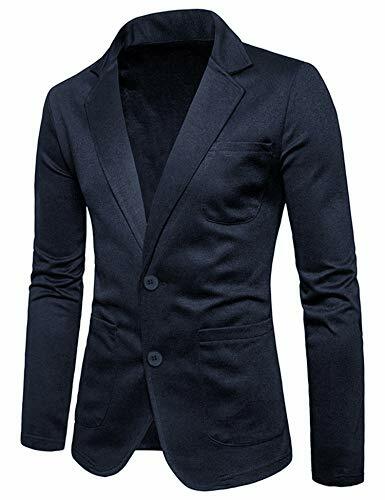 SUIT BLAZER DESIGN --- Modern fashion Lightweight Suit Jacket Blazer with notch lapel, one button closure, left chest real pocket, two front flap real pockets, Inside a real pocket. CASUAL and ELEGANT LOOKING --- Finished by excellent stitching, the stylish blazer has a linen texture specially designed for western men, will really make you minimalistic, elegant, and generous and in the crowd. RECOMMENDED PAIRING --- Match with a white tee shirt, a pair of casual shoes and your daily pants maximum help improve your public image and leave an unforgettable impression on people around you then. 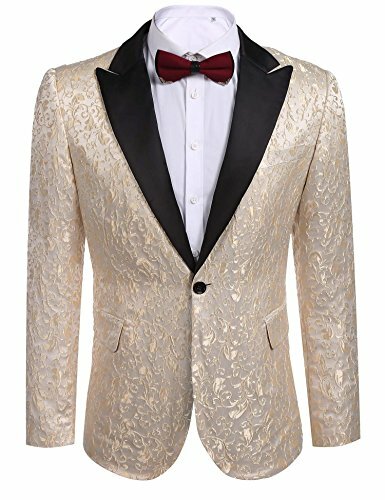 BEST OCCASIONS --- This is the best blazer in men's wardrobe, suitable for banquet, wedding, graduation, nightclub, disco, ceremony, dating, meeting, yacht party, prom, celebration, festival, etc. MATERIAL --- Polyester; Dry Clean Only(Recommended); Hand washes max temperature 40°C, Do not bleach, Iron max 110°C. 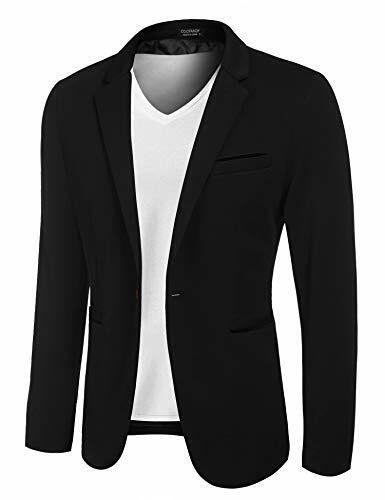 CASUAL AND ELEGANT LOOKING --- Finished by excellent stitching, the stylish blazer has a comfortable texture specially designed for western men, will really make you minimalistic, elegant, and generous and in the crowd. MATERIAL --- 35% Cotton, 65% Polyester; Dry Clean Only(Recommended); Hand washes max temperature 40°C, Do not bleach, Iron max 110°C. CASUAL AND ELEGANT LOOKING --- Finished by excellent stitching, the stylish blazer has a soft texture specially designed for western men, will really make you minimalistic, elegant, and generous and in the crowd. Size: Please refer to the size chart on the Product Description. If you have any size problem, you can feel free to contact with us. We will response back within 24 hours. Wish you have a good shopping experience here. Thanks a lot! NOTE: Because the suit is sold in sets, if you choose to return, please return it in sets. ★ NOTE: This is Casual blazers and sport coats. It's like a cross between a sweatshirt cardigan and a blazer. featuring single-breasted Two-button closure. 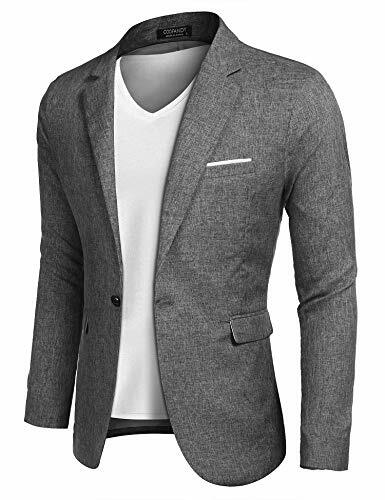 Classic Notched Lapel, the left chest pocket on front, Two front pockets. 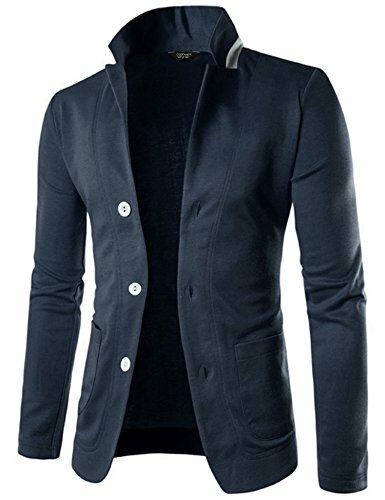 Fashion cotton jacket with comfortable and nature hand feel, skin-friendly, no any harm for the skin. Not easy wrinkles. A quick steam will smooth. ★If you like slim fit. please choose a size small. 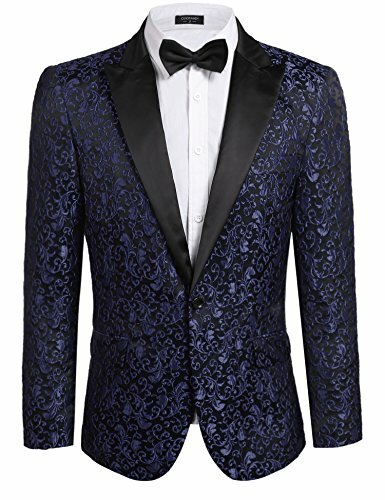 Please check your measurements to make sure this sport coats jacket fits before ordering. Occasion: We recommend it as your casual wear, and it can be easily matched with shirts and pants. Also suitable for Party,Dates,travel,Daily,Graduation Party ,Prom etc. Care instructions:After washing or wetting should be timely dry;Recommended handwash;Don't expose it to the hot sun a long time. 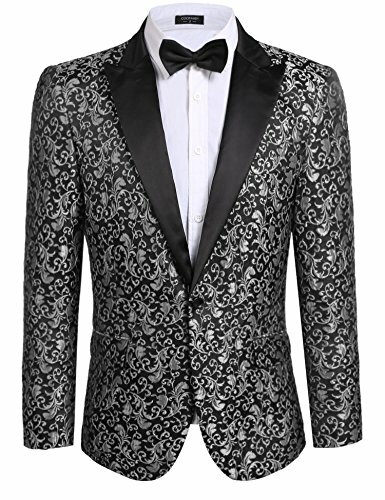 DESIGN: Suit Blazer is usually easy to give a serious sense. 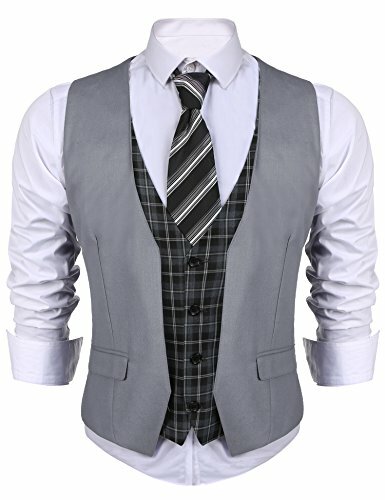 But this suits add plaid and fake two-pieces elements that can make you look more casual but decent. OCCASIONS: Wedding, Festival, Dinner, Date, Celebration; You could dress it on Casual Occasions or Formal Occasions.That will be perfect. 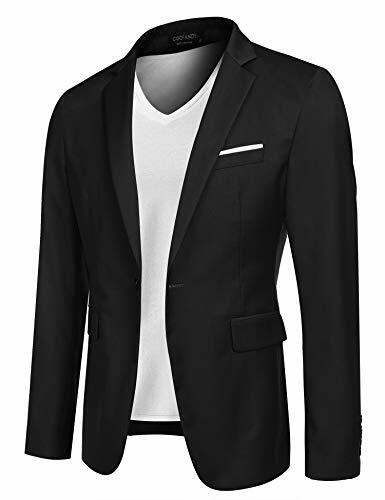 MATCH: Team the black item with white shirt and a pair of navy blue jeans; Team the grey item with white shirt and a pair of black suit pants; Team the khaki item with white shirt, blazer, and a pair of black pants. 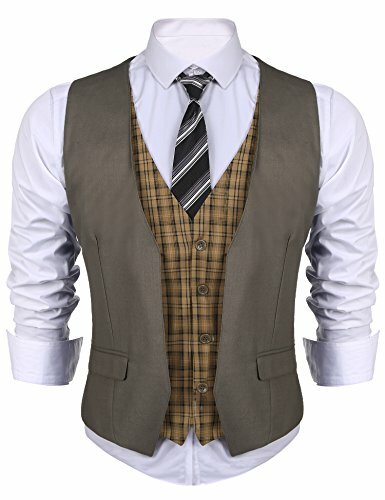 Anyway, you could wear formal or casual with Coofandy fake two pieces plaid vest. Please show us your special matching if you are willing to. Thank you very much. NOTE: This is a slim fit Vest in US size,so if you want to loose fit, you'd better order one step bigger size than your original size. 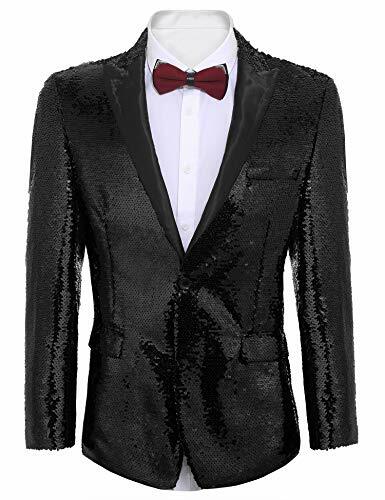 Shiny Looking:all over sequin decoration make this blazer really sparkling.With this blazer,you will be the most outstanding one in the crowd. 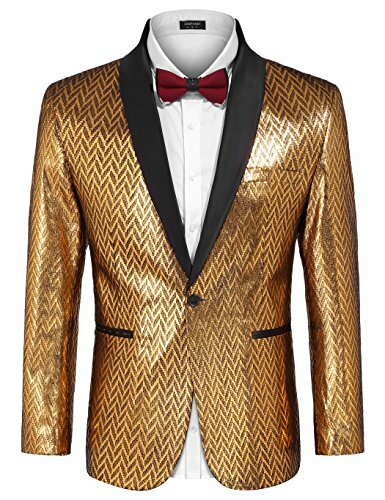 Occasions For:this shiny sequin blazer is suitable for Christmas Party,Performance,Banquet,Wedding,Graduation Ceremony,Proms,never let you fade in front of crowd. WARM TIPS - Please check product description before ordering to ensure accurate fitting, can use similar clothing to compare with the size. Wash it before wearing.Hand wash or Dry clean recommended. This slim fit suit blazer is made from cotton blend fabric. It's comfortable, skin-friendly, no any harm for the skin. Stylish solid sport coat blazer with three Buttons closure featuring flap pockets at sides. Contrast Color lapel collar. 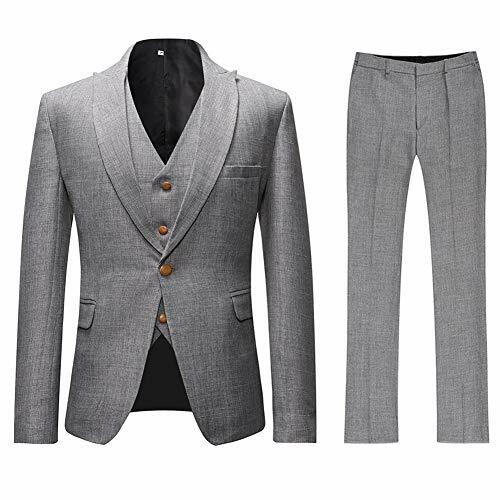 Slim cut with 3D draping embraces both modern and traditional style this suit jacket makes you sharp and handsome. Occasion: We recommend it as your casual wear, and it can be easily matched with shirts and pants. Flap pockets on new suit jackets are sewn. Please cut the pocket stitching if necessary.